Who Is a Korean Female Vocal Perfectly Covering BTS' FAKE LOVE and BLACKPINK's DDU-DU DDU-DU? Bolbbalgan4 also known as Blushing Youth covered songs of BTS and BLACKPINK. Bolbbalgan4 is a Korean duo consists of Ahn Jiyoung and Woo Jiyoon who are famous for unique singing voices. The duo held a third solo concert on July 16 at the Olympic Hall with a theme of 'journey'. In addition to their hit songs, they've covered songs of numerous artists, and above all, BTS' FAKE LOVE and BLACKPINK's DDU-DU DDU-DU gained most enthusiastic responses from the audiences. Woo Jiyoon is a vocal but she managed to pull off FAKE LOVE, including the powerful dance break of Jungkook. It was a stage that let people know that female vocal can carry out the song and choreography of a boy group. How did she manage to cover BLACKPINK's DDU-DU DDU-DU? 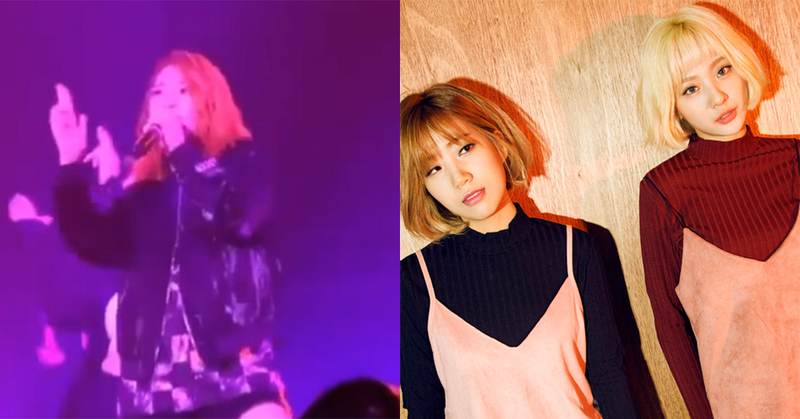 Woo Jiyoon passionately sang the song but never leave out the "gun shooting" point choreography. Indeed it was an attractive performance for the fans of Bolbbalgan4, ARMY, and BLINKs.